That day was like something out of a storybook. When I got married to my husband eight years ago, I was floating on cloud nine. All of the work that went into planning my dream wedding had finally come to life. The gown was stunning, the venue, impeccable; even the tablescapes were magnificent. Today we have two beautiful kids and a happy marriage, but it’s nearly a decade later the honeymoon stage has long-ago faded. We will be celebrating our wedding anniversary in a few months, and we both thought that this day was cause for a big celebration, you know, to rekindle the romance. We decided to take the trip of a lifetime together; no kids, no distractions, just the two of us. Every year you celebrate the special day when you said your heartfelt vows to your partner. I think each anniversary should be celebrated in a memorable way if it’s your first or fiftieth. If you have a special anniversary coming up and you’d like to give her a gift she’ll never forget, there are few things better than taking a trip to an exotic location together. The tropical breeze, tasteful libations and intimate one-on-one time will set the tone for an unforgettable, romantic vacation filled with pleasure, passion and more. An escape to a new destination is not only exciting, it gives you time to reconnect and rekindle the passion that brought you together in the first place. To give her the ultimate surprise, you might want to start your anniversary celebrations by doing some of the traditional thoughtful gestures you normally do each year, like buying her custom jewelry and sending flowers directly to her doorstep. Along with that beautiful bouquet, be sure to enclose a charming note inviting her to join you on a fabulous escape to (insert destination here). With an invite like this, she has no choice but to say yes! Whether you prefer adventure travel or you and your honey are in need of some serious R&R, or you just want to indulge in the ultimate romantic trip, get your passports ready because these destinations are sure to fit the bill. Forget the cookie cutter vacations that are bland, boring and simply overdone. 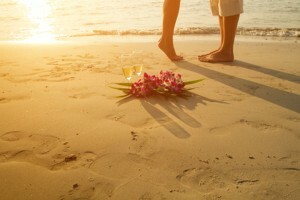 Impress your special someone with a special excursion through the Galapagos Islands. The islands have become an increasing popular travel destination, going from just under 12,000 visitors in 1979 to over 200,000 in 2013, according to the outdoor experts at Galapagos Park, there are still relatively few people who get the chance to explore this microcosm of evolution. If snorkeling with turtles, sea lions, and dolphins, sea kayaking while spotting whales and bounding across desolate lava fields while watching the mating rituals of blue-footed boobies sounds like your ideal vacation, this is the anniversary getaway for you. The islands are located about 600 miles off the coast of Ecuador, offering a unique chance for adventure junkies to experience one of the most unspoiled places on our planet. There are few things more romantic than capping off a day filled with thrilling activities by relaxing together on a pristine stretch of white sandy beaches dotted with sea lions and iguanas while watching a dramatic sunset across the dazzling Pacific Ocean. Paper yourselves in luxury. Bathe in soothing geothermal Icelandic waters, enriched with powerful healing ingredients like algae, minerals and silica for the ultimate relaxing experience. Named one of National Geographic’s “25 Wonders of the World,” Blue Lagoon is home to some of the best natural outdoor saunas, and refreshing geothermal saltwater and fresh water hot tubs. VIP guests can experience the luxurious amenities of the Blue Lagoon Exclusive Lounge. During a three-hour stay, visitors can enjoy access to a private area equipped with an outdoor deck overlooking the lagoon, fireplace, and admittance to exclusive shower rooms including light refreshments, and a package of the top skin care products. Blue Lagoon hosts its own team of seasoned specialists. With help from some of the worlds top scientists, these on-site specialists have seamlessly blended science and nature to create a powerful skin care line and a variety of other health treatment products like facial scrubs, wraps and exfoliates that have been said to decrease signs of aging and soothe psoriasis. Indulge in a side by side custom massage in the peaceful waters to relieve your body of muscle tension and stress. Leave your vacation refreshed, rejuvenated and even feeling younger. Win over your princess, Prince Charming, with a stay against a landscape that feels as if you may have walked directly into a painting, including majestic heather covered mountains, splashing waterfalls, and spectacular ancient castles. The Isle of Skye sets the perfect stage for a picturesque, romantic, fairy tale vacation. Located just off the west coast of Scotland, connected by the Skye Bridge, the isle provides the opportunity to explore a fantastical world known as the Fairy Glen. Enjoy daytime picnics at the edge of scenic lochs, and saddle-up for horseback riding along the beach. Dunvegan Castle offers visitor tours of the extraordinary 18th century Highland estate which includes five acres of thriving formal gardens, a hidden oasis filled with shimmering waterfall-fed pools and streams that gently flow into the sea. As you depart from the gardens, take a privately chartered cruise in traditional clinker boat across the waters of Loch Dunvegan at sunset. To up the romance factor, stay in a cozy and quaint cottage overlooking the sea. Spend your evenings cuddled up next to the fireplace while reflecting on your day in this treasured utopia. Pack up your suitcases with sandals and easy-breezy light-weight linens. For those looking for the ultimate in rest and relaxation in a tropical setting, Los Roques, an Archipelago National Park set about 80 miles off Venezuelas coast in the Caribbean, offers an ideal tropical escape. You’ll find no high rises here, only limitless stretches of perfect sands surrounding by glistening crystal clear waters that feel as if you’re on your very own cast away island. Here, the sands of time seem to pass very slowly, providing couples with a chance to halt their busy and stressful lives for a moment and reconnect without distraction. Escape the headache and strain of city life and let your mind be at peace. Unwind from your fast paced lifestyle with activities like fishing, sailing through the crystalline waters, diving, and snorkeling amidst stunning coral reefs. You can spend your days together enjoying your time lounging on the soft sands, taking leisurely walks into the warm waters, and spend your evenings watching the sun go down across the Caribbean with delectable mojitos in hand.